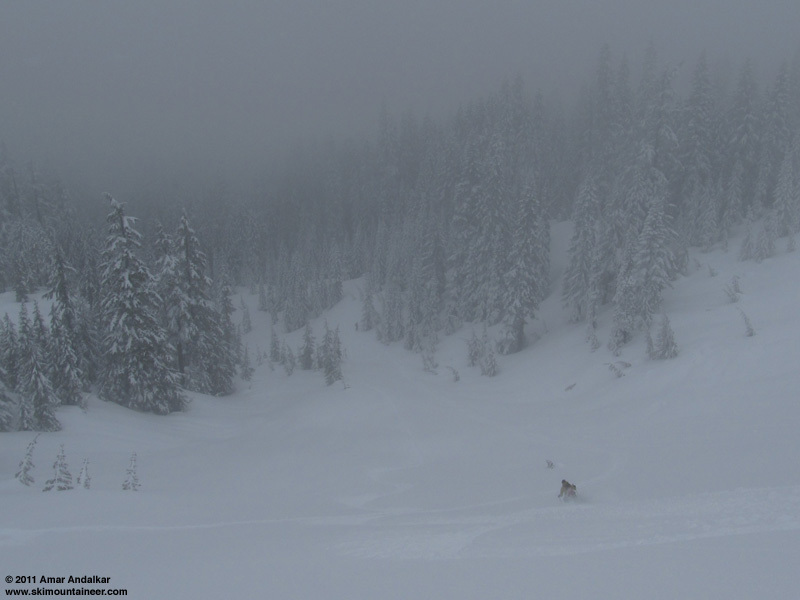 Telemetry showed 14" of light powder overnight at Paradise, far more than any of the other local destinations, so that seemed like a good choice for this Sunday, perhaps skiing some sweet north-facing powder lines in the Tatoosh if snow stability allowed. The park's 7am phone recording stated an 11am-noon road opening, so we went back to sleep for a bit and started from Seattle with a leisurely 8:30am start. The recording was updated a bit later, giving the same opening time, but adding three worrisome words: "pending avalanche assessment". Uh-oh, but there was still no mention of an all-day closure. We got to the park entrance just after 11am, and the ranger informed us that the road would be closed all day. WTF!! In numerous winter trips to the park, that's the first time I've actually had the road not open at all (endured many many late openings, obviously). What to do? One in our group of three was ready to pack it in and head back to Seattle, but cooler heads prevailed and we devised a fallback plan: we'd head for the powder of the Tatoosh by another route, up the Eagle Peak trail which starts on the other side of the historic suspension bridge over the Nisqually River at Longmire. About 6" of new snow had fallen overnight even at Longmire (2760 ft), so this seemed like a feasible plan. Except we had no map which extended far enough south to cover Eagle Peak, I had only a vague idea that the trail started somewhere on the the other side of the bridge, and the park topo map we bought at the Longmire Museum was too small-scale to figure out where the actual trail started. We drove across the bridge, missed the barely-marked trail entrance beside the road in the new snow (just after the bridge), and parked at the community center about 1/4 mile farther. Skinned up at noon, following the only other set of ski tracks, which led off in the wrong direction along a road, part of the former Longmire campground (closed to the public for decades, now being resurrected as a park-volunteer only campground). 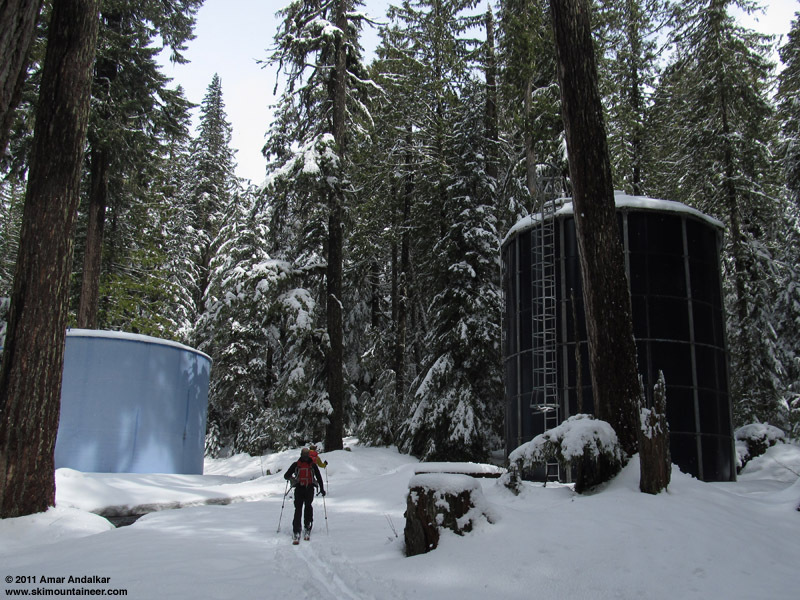 We turned uphill on a gated road, which led steeply through the woods to a pair of large water tanks. If only we had a decent topo map (like this http://mapper.acme.com/?ll=46.749,-121.795&z=15&t=T), everything would have been obvious, but we spent some shenanigans following marked (but unofficial) trails in the woods along parts of the Longmire water system before eventually heading north through the woods to intersect the real Eagle Peak trail, which looked like a snowshoe highway by 1pm. Warming temperatures near 40 �F made for very wet snowmelt showers in the forest, but progress was quick up the well-stomped trail and eventually we got high enough that the snowmelt showers ceased. More and better powder above 4000 ft, with eventually over a foot of fairly-light freshies atop the solid March 31 rain crust. As we neared 5000 ft, we moved into the cloud deck and visibility dropped to a few dozen yards, not really enough for travel above treeline in the open bowl that we reached (just south of Chutla Peak). We were intending to head for the saddle south of Chutla which provides access to the rest of the Tatoosh Range, but the west-facing bowl had numerous large sections of old avy debris buried by the overnight snow, and given the low-vis, we turned around at 5300 ft, still 300 ft shy of the saddle. Enjoyed a few nice powder turns in the lower part of the bowl and then through the open forest. 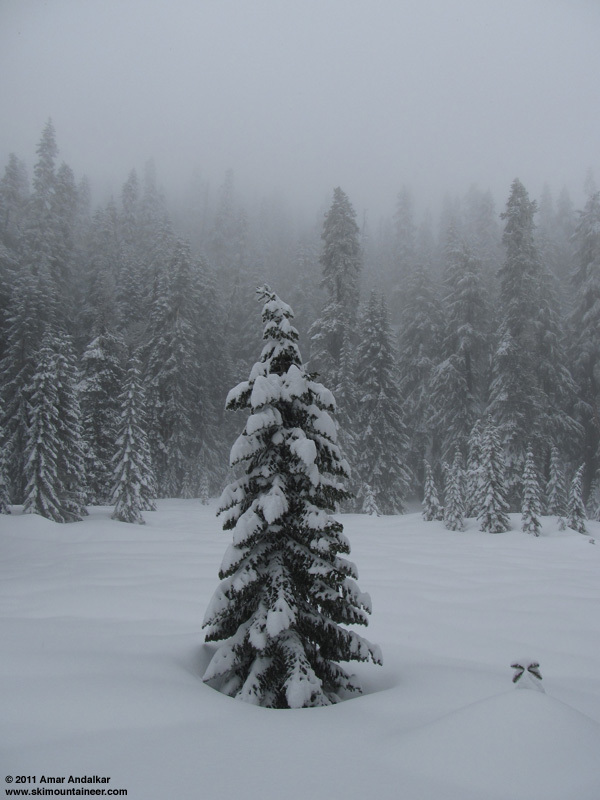 The snow got heavier as we descended, and was eventually just a few inches of dense new snow atop the crust. Below 4000 ft, it was essential to stick to the trail, not enough coverage at all in the woods. We managed to ski out all the way to the road (2800 ft), avoiding numerous protruding rocks on the lowest part as snowdepth dropped to only 2-3" of packed snow on the trail. Anyway, it was great to salvage something out of the day, after the utter disappointment of the road not opening. The Eagle Peak trail seems like a good option for skiers when the park road fails to open and there is snow down to Longmire, it's got a lot of snowshoers, but they're not exactly stealing first tracks. Word has it that MRNP had to get Paul B. and a Federal Hwys rep to blast the slopes (3X) across the road (and downhill from there) from Barnes Flats because of hanging avalanches waiting to happen; had a few runouts over the lower road. Nice report; it's one ski trip (of so many of yours) that I haven't made.� However, it is my all-time favorite snowshoe route on a sunny day--the sun lights up the old-growth forest from the bottom up, presenting views and understanding never available from spring-summer-fall snowless expeditions (I've visited and/or quantitatively described old-growth forests from Vancouver Island to the ancient bristle-cone pine forests of California, and all types in between). BTW, we used to ski from Longmire through the old campground (what a nice campground!) down the road and pickup the forest road that leads backup into the forest for a nice, trail-breaking XC ski; in recent years we stopped because the Park was plowing the road through the campground (they have a utility center on the far side). Thanks for the tip, Andrew and Amar for the pointer and commentary. We got to the park entrance just after 11am, and the ranger informed us that the road would be closed all day. WTF!! In numerous winter trips to the park, that's the first time I've actually had the road not open at all (endured many many late openings, obviously). What to do? Welcome to the club, Amar!� At least you got the straight poop at the entrance.� It's not unknown for the morning phone message to promise an update which is never recorded, or for the entrance to give different info than Longmire...� Then there's what my buddy Winter Raven calls the 'stealth opening', where the recorded message says closed, but the road to Paradise actually opens! 1)� There's the Horse Creek logging road that Andy mentioned.� The plowing stops about a quarter mile past the Longmire CG at the Longmire sewage treatment plant.� The first mile is probably more suitable for pattern-based skis, but with a long slog, one can reach the south side of the Tatoosh or Lookout Mountain.� There may be snowmobile tracks to ease the climb and with good coverage there are possibilities for shortcuts & turns in the upper clearcuts, starting about 4 miles up. 2)� Another long slog is to climb the Wonderland Trail to Rampart Ridge and follow this into Van Trump Park.� Like Horse Ck, this is probably better as an overnighter, unless you get an early start.� It's shorter, and saves removing skis to cross the road, if you follow the Trail of the Shadows north to the historic Longmire family meathouse, then leave that trail & climb a short hill about a hundred feet to the summer Wonderland trailhead. 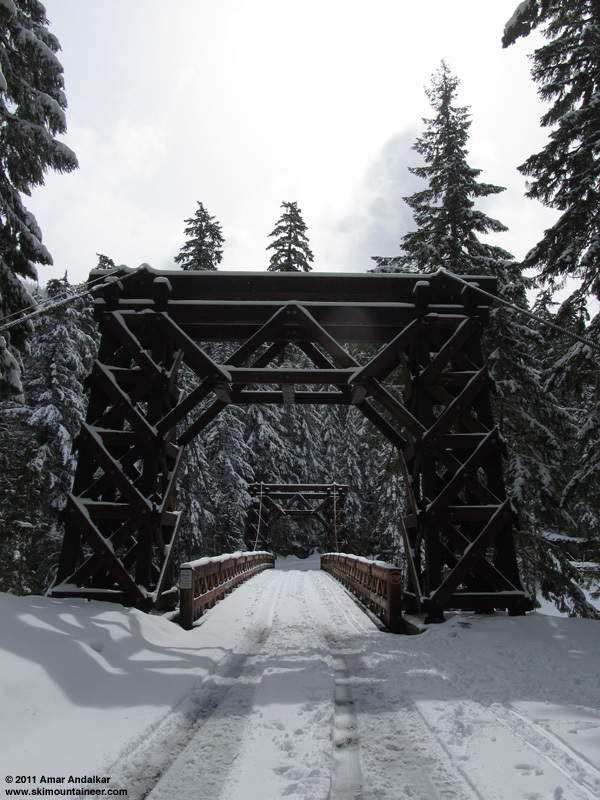 3)� One of my favorites is the Kautz Trail to Mt Ararat.� The footlog about a mile up is often washed out in winter, but there should be plenty of other natural log crossings since most of the creek relocated farther E in 2006.� Just after entering the old growth forest, the trail is a steep, deeply incised rut between large cut logs that usually requires carrying skis for a few hundred yards.� Thereafter, the trail is quite skiable, if you can stay on it.� The SE & SW ridges are the safest way to the top; beware the large avy path on the lee E side that the summer trail finally traverses into Indian Henrys. 4)� When the leaves are gone, look across the river from just above Copper Creek restaurant a couple miles outside the Park and you'll see a narrow, moderately-inclined avalanche path leading up about two thousand feet to a large clearcut and natural clearings on the N side of Osbourne Mtn.� This is best accessed from the USFS Big Creek CG near the start of Skate Ck. road.� Unless the snow coverage at the 1800' campground is exceptional, it's probably easiest to boot up the FS trail about 5-600 vf from the campground to where mountainside steepens, then bash across a couple difficult initial ravines to a slight benching that traverses to the 'Osbourne Coolie' about a mile E of the trail.� Be sure to mark your route for the return.� The lower part of this coolie can be a hell of brush & down logs if you try to descend directly to the campgound. 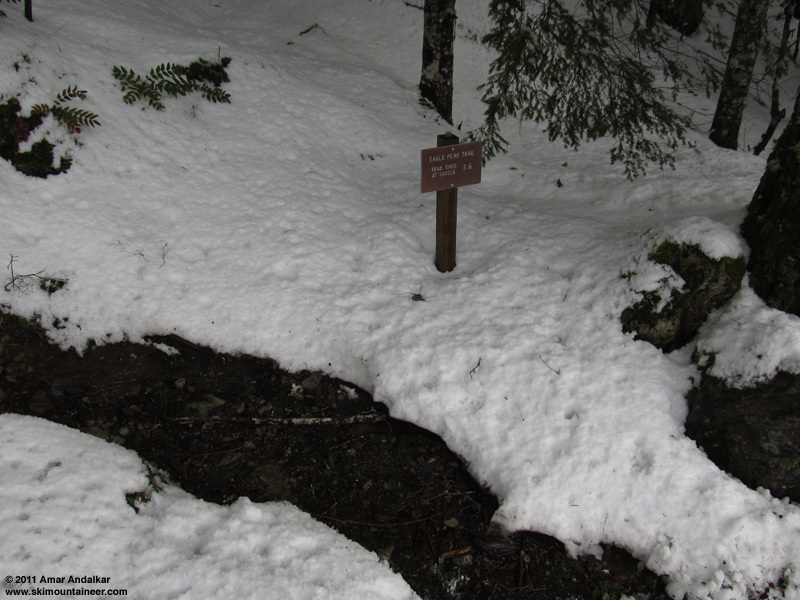 5)� If one has a high-clearance 4WD or the snowline is above 3000', Mt. Beljica (5475') in the Glacier View Wilderness west of the Park can be a satisfactory ski outing.� Take USFS Rd #59 (Copper Ck) about four miles to the turnoff to the Lake Christine trail.� One can climb directly to the ridge from near this road junction and save several miles on the 59 road; you may have to boot up through the doghair reprod at the start if coverage is poor.� The ridge E toward the summit has a couple short sporty cliff bands; these are Oligocene lahars interbedded in the tilted muds & sands of the Puget Group, as are most of the high points in this area.� For better snow, descend a few hundred feet from the ridgetop on the north side to the large Beljica Meadows and then climb through steep open forest to the broad saddle E of Mt. Beljica.� I'd advise avoiding the Lake Christine trail since it traverses very steep slopes beneath cliffs and may be avalanche-prone.� I've also skied to the top of Peaks 5850 (Eagle Rock) and 5528 via their SE ridges from the Goat Creek spur described below. Thanks for the great info and detailed list of ski options, Gary. The only one of those which I've tried yet is Wonderland Trail to Rampart Ridge and into Van Trump Park, which we did intentionally in early January 2009 while the road was closed at Longmire for several weeks, due to the landslide on Glacier Hill past Nisqually Bridge.